There was a time, not so long ago, when you could simply drink from a lake or stream that you found while camping with no ill effects, but that is no longer possible. These days you need the best backpacking water filter for your outdoor expeditions. There are a variety of ways to filter your water. Most people do not know this however. When thinking of water filtration systems, most people think of pump-action water filters that are heavy and clunky. These filters are most definitely not the kind you want to go hiking or camping with. Instead, try some of the lighter, smaller filtration systems out there. There are filters that purify water using gravity, that look like straws allowing you to drink directly out of your water source, and even systems which cleanse your water using UV light. There will be advantages and disadvantages, no matter what system you choose. In this article, we will discuss these, along with explaining about how water is filtered, why you should filter and what will happen if you don’t. After all of this, if you haven’t chosen your water filtration system yet, we will offer you a buying guide. This set of tips is your key to picking the perfect travel water filter for your needs. 2 Why Filter Your Water? 3 What Microorganisms Exist in Untreated Water? 4.1.1 So Which Should I choose? 4.2 What Types of Personal Water Filters are There? 5 What are the types of Water Purifiers? 7.5 Where Will You Travel? Obviously, water is needed for people who are camping or hiking. Carrying all your own water adds a lot of weight to your pack, making your trek absolutely miserable. But what about water sources you find in nature? On the surface, it may seem easier to just drink the water from lakes and streams. If it looks clear, then it’s probably safe, right? Wrong. Many harmful microorganisms live in untreated water and they could make you very sick or even be fatal, depending on the microorganism you run up against. That is why it’s always best, when hiking or backpacking, to have a portable water filtration system on hand. If you intend on traveling internationally, water purification is even more vital. International water sources often have viruses that do not exist in North America and Canada, as well as the microorganisms mentioned above. What Microorganisms Exist in Untreated Water? There are a variety of microorganisms that exist in untreated water, dependent on your location. These include bacteria, viruses and protozoa. Some examples of waterborne pathogens are listed below. Cryptosporidium: Causes the disease cryptosporidosis, which is characterized by watery diarrhea, vomiting, stomach pain and fever. This disease can be chronic or fatal in people with compromised immune systems. Giardia: Is one of the most common waterborne infections in the United States and usually is transferred through backcountry water sources. Symptoms are intestinal and may include diarrhea, excess gas and vomiting, with eventual dehydration and loss of nutrients. Vibrio Cholerae: The virus that causes cholera isn’t common in the United States. However, it is common internationally, especially in countries without advanced sewage treatment. This virus can cause death. E. Coli: Though humans have a large harmless colony of this bacteria in their lower intestines, it can be harmful if it enters the upper intestine. It can cause diarrhea and other stomach upset, and could be far worse on people with compromised immune systems. Hepatitis A and other viruses can also be transmitted via water supply. Though they are not considered a huge threat in the United States and Canada. However, if you plan on traveling internationally, these become a much larger risk. The filter you choose will dictate what sorts of microorganisms you can filter out. For example, bacteria are the easiest to filter as they are larger than both protozoa and viruses. As you can see, filtering water is quite important for your safety as well as the safety of anyone else you may be camping with. However, you may be unsure what types of filtration methods exist. In this section, we will discuss the various types of portable water filtration systems, as well as how they work and their advantages and disadvantages. We will also discuss the differences between filters and purifiers. On the surface, filters and purifiers may sound like the same thing, but this isn’t true. A filtration system works by using a pump or gravity to actually force water through a physical filter with small pores that strain out contaminants. A purifier, on the other hand is usually a chemical which can be added to water to kill the microbes within. So basically, the difference between filters and purifiers is this. Filters simply remove the microorganisms and store them on the filter medium until you clean them off. Purifiers actually kill them. Both purification systems and filtration systems have their advantages and disadvantages. Filtration systems work best on protozoa and bacteria, while a purification system will kill viruses. With that said, there are some protozoa, such as cryptosporidium, that are not easily killed by purifying chemicals due to their hard outer covering. For these creatures, a filter works much better. For this reason, most experts suggest carrying both a purification method and a filtration system with you when you travel. Since the purification tends to be chemical (though UV light can also be used), it is relatively easy to slip one into your pack, and it will not add that much extra weight beyond the weight of the filtration system you are already carrying. What Types of Personal Water Filters are There? There are several types of outdoor water filters. The type you pick will depend greatly on where you are traveling, your budget and the amount of weight you want to carry. If you are a visual learner, you can check out this video. This is a video about the various types of water filtration. Pump systems used to be the gold standard for water filtration. These systems work by forcing water through a filter with small pores using a pump which is operated by hand. 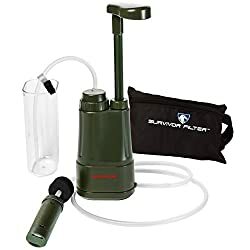 The advantage of this type of system is that it can filter a large amount of water at one time, great if you are camping in a group. The disadvantage is that it generally takes a lot of time to pump the water. As a note, if you are traveling abroad, these systems may not be your best bet as most of them don’t actually do well at killing viruses. As the name suggests, a gravity water filter uses gravity to accomplish filtration of your water. Using this type of system takes less time than using a pump. Another advantage of the gravity system is its weight. These systems tend to be some of the lightest on the market. Much like pump systems, gravity systems do not generally kill viruses. Furthermore, they usually cannot handle as much water at once as a pump filter, meaning they are not as well suited to group camping trips. 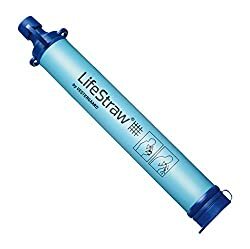 The third kind of system is the straw filters, such as the Lifestraw personal water filter. 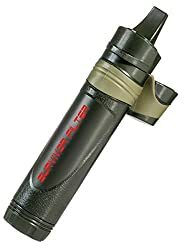 These are some of the best hiking water filters as well as being great to have around in an emergency when water may not be the cleanest. These simple devices are drinking straws with an ultrafiber filter inside. To use one, either screw it to an existing bottle of source water and drink from it as you go or drink directly from the lake or stream. As you drink, the water is pulled across the filter by suction, and bacteria and microbes are caught and kept safely out of your mouth. What are the types of Water Purifiers? There are two chemicals used for purifying water. The first of these is chlorine dioxide, the same chemical used to treat municipal water. The second chemical is an older solution, iodine. No matter which chemical you use, it will be bought in one of two forms, drops or tablets. Pick the form that you feel best fits your needs. Picking the best water purification tablets depends on your preferences. However, remember that both chemicals have their advantages and disadvantages, which we will discuss below. Iodine is the older form of water treatment chemical. It can kill bacteria, viruses and protozoa in as little as thirty minutes. However, it also has disadvantages. Foremost, iodine gives the filtered water a very bad taste. When your water tastes bad, you are less likely to drink enough. Also, iodine makes the bottles you use to hold your water smell for a long time after, which will make subsequent water served from those bottles smell or taste horrible also. If you intend on using iodine tablets, it would be advisable to also get an ascorbic acid tablet too. These will remove the foul taste of the iodine. Chlorine dioxide kills viruses and bacteria in thirty minutes, just like iodine. Since it is the same chemical used to treat your drinking water at home, it will make your filtered water taste like tap water. The disadvantage here is that if you want to kill cryptosporidium, you must wait four hours before drinking your water. The reason for this is that cryptosporidium have a hard outer shell that makes them difficult to destroy. The last type of purifiers use UV light to scramble the DNA of the bacteria in the water. They take the least amount of time and do not change the water’s taste. However, on the downside, these purifiers do take batteries and the battery life tends to be short. Therefore, if you use this method, you will have to carry extra batteries or some form of solar charger. Now that you know how water is filtered or purified, it is time to get to the meat of the article, the reviews. These are our picks for the top ten best outdoor water filters. When you have finished this section, you will have a good idea of what the best filters and purifiers are, and you will be able to choose your new filtration system wisely. Having a Lifestraw can be very important during a natural disaster. It is small, compact and almost effortless to use. Weighs just two ounces which makes it perfect for backpacking and hiking. Allows you to drink from any water source. Is an important tool for those who plan to travel internationally. Does not screw onto a storage bottle. All drinking must be straight from the water source. The Sawyer mini water filter is tiny and light. Forget slipping this into a pack. You could slip it into the pocket of your pants. Included sixteen-ounce reusable squeeze pouch for drinking directly from the filter. Can be screwed onto most commercial water bottles. Can be attached to your hydration pack without adapters. Comes with a personal drinking straw which allows you to drink from any lake or river. Maintenance is easy. Simply backwash and sanitize the filter. Fastest flow rate for its size. Surpasses the EPA standard for clean water. 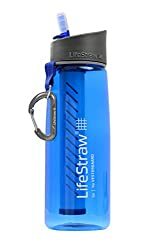 If you’ve ever wanted a lifestraw that is attached to a durable water bottle, this is what you’ve been waiting for. Simply fill this bottle from any pond or stream and drink from the straw. Produced by Vestergaard, a leader in disease management in developing countries. For every Lifestraw Go sold, a child in Africa receives a year of clean drinking water at school. Filters a thousand liters of water before needing to be replaced. Some units have a chemical aftertaste. In an emergency, clean water is not a given. This amazing survival system with three stages of filtration will catch things most other filters won’t, making it great in an earthquake or hurricane. No storage of water necessary. Simply submerse the straw and drink. Filters bacteria, protozoa, chemicals, insect contaminants, heavy metal ions and more. Includes backwash device for easy cleaning, an extension tube to enhance your reach and a pre-filter for water that is very turbid. Filter inside the straw is not replaceable, requiring you to buy a new straw every 1,500 liters. Flow is slow due to small filter pore size. If you’re looking for the best water filter for backpacking, you’ve found it. This filter’s small size and minuscule weight make it excellent for any size backpack. Includes reusable sixteen-ounce water pouch. Scoop up a bottle of water from any fresh water source. Not appropriate for group camping settings. This is the best camping water filter. It comes with a cleanable membrane filter, replaceable carbon tablets and cotton pre-filters. Able to filter down to 0.05 microns. Comes with carbon tablets to improve taste. Includes cotton pre-filters to filter out large particles. Must replace filters every 264 gallons. 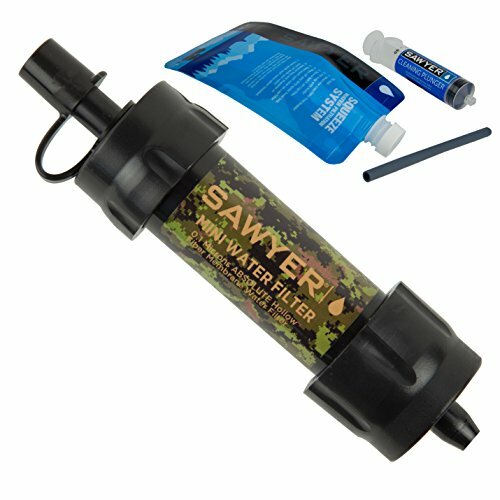 Sawyer Products is one of the foremost experts in water filtration. This particular system has the highest rate of bacteria and protozoa removal on the market. Lightweight and easily portable. Perfect for tucking into your pack. Built-in and removable push pull cap that allows you to spray water into your mouth or into a water bottle. Comes with adapters for use with a hydration bladder pack. This upgraded version of the Survivor system will filter your water down to 0.01 Microns. It also features two cleanable UF membranes and carbon tablets to help with taste and the filtering of heavy metals. 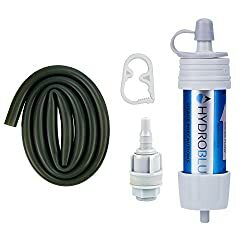 Best water purifier for camping as it can pump enough water for group use. Pump water directly into a cup or other vessel. Light-weight and designed for durability. Adjustable floats to keep the pre-filter off the bottom of the lake or river bed. Included drinking cup does not work as a measuring cup. From the makers of the Katadyn Hiker Pro comes this multi-flow water filter. This filter provides a lot of water with little effort. Dual pistons mean that you get a lot of water for the least possible effort. Filters to 0.2 microns meaning that it will catch all the sediment and microorganisms found in fresh water. Has two flow modes. The fast mode produces two quarts a minute, while the longer life mode produces one quart. Includes a pre-filter, carrying bag and cleaning pad. Weighs fifteen ounces, so a bit more than some water filters and is more bulky than the Katadyn Hiker Pro. May become air locked and stop pumping. If you are looking for a truly versatile water filtration system, this one is for you. It can be used in four different ways to make sure you’ve always got clean water. Screw it onto your water bottle, use it inline to your hydration pack, use it as a gravity system or drink directly from the lake or river. 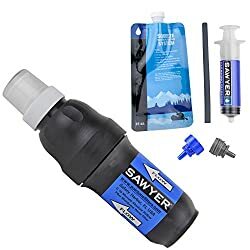 Best water filter backpacking as you don’t have to carry much extra weight. Almost indefinite lifespan if you backwash it. Beats the EPA recommended amount of filtration. Does not filter out chemicals from the water. Now that you have reviews of the top ten best hiking water filters, it is time for you to pick your own. To help you in this task, we have included this handy buying guide. This guide contains all the information you need to properly choose a water filtration system as well as pointers on how to pick the perfect one. Do you often hike or backpack alone? If so, a personal water filter would likely be your best bet. If you often travel outdoors with other people, however, you are going to need a filter that can handle a lot of water at a time. A pump system or gravity system may be a better idea for you. Water filtration systems range in price. The cheapest run about $20. However, if you want the best water filter and are backpacking with a group, be prepared to spend anywhere from $300 to $600. When you are in the field, you don’t want to have to fiddle with your filtration to get fresh water. Systems that are overly complicated might as well be dead weight in your pack. Instead, go for a system that is easy to use with minimal parts. That way, there is less chance of something breaking while you’re in the field. Doing this also means that you will be less likely to get frustrated and just drink the unfiltered water. The weight of the filtration system or purifier you choose is another important factor. Some systems are lighter than others. For example, some water filters weigh eleven to sixteen ounces and can be bulky. This sort of filter requires a dedicated spot in your backpack. When you are hiking or backpacking, any extra weight can become a large problem and limit what you can carry. Choosing a lightweight water filter whenever possible can save your back. Water purification tablets also are very lightweight. They take up far less space than even the smallest water filtration systems. UV purifiers can also be a good option. However, you should be aware that if you are going to use them, you will need batteries or a solar charger. Also, if you plan on using UV purification, it would be wise to pack some iodine or chlorine dioxide tablets just in case the batteries die. The places you plan on traveling affect what sort of filtration or purification you need. In the United States and Canada, viruses are not very common in the water supply. However, if you travel overseas, you will likely need a filter that can kill viruses. A lot of countries don’t have proper sewage treatment so their water becomes contaminated. Having a good water filtration or purification system can literally save your life, or at least keep you from being in agony. Pick a filter which fits your budget and will serve the number of people you will be traveling with. Choosing a water filter backpacking that is lightweight will also save you a lot of pain. Pick one that is small enough to slide into a side pocket. If you pay attention to the information given in this article, you will be able to pick the best backpacking water filter for your needs with ease.